If I ask you question about your favorite search engine, most probably the answer will be "Google" and why not? It's most loved search engine ( and even most used website worldwide ) so far. Tons of search queries are made each second. Its simple to search over google. you just need type your query and it will automatically display best results from its database. However there are few useful tips you need to know in order to increase more search accuracy and to get better touch with it. In this tutorial, I clearly explain how to google search with more advanced tricks and tips which are helpful to find the exact thing you're looking for. Replace "you site address" with any website URL whose data you want to archive. The search result thus found would have 1st priority to main home page i.e., If I searched for amazon, than main domain will appear first. 2nd priority goes to pages and 3rd to posts. Find link that you're looking for and enjoy this amazing tricks. This is another well-known operator which will display all popular websites related to one you searched. I know it's quite hard to understand above statement. Let me take an example. For instance think that you know about google and want to find more search engines which have similar properties and do same work as it. In such conditions, this related operator can help you to find them in single place. The syntax is same as that of site operator. Again replace "your site address" with website URL whose related sites you want to surf. 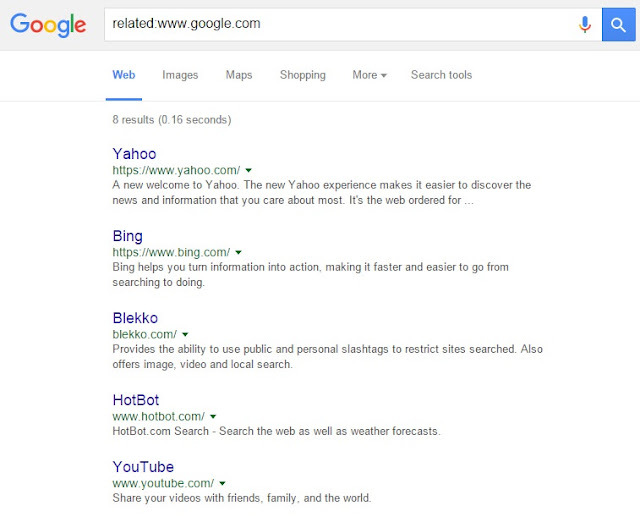 See how in below picture, I used related operator for google domain and it show up top 5 results as: Yahoo, Bing, Blekko, HotBot And Youtube which are well-known similar sites to it. 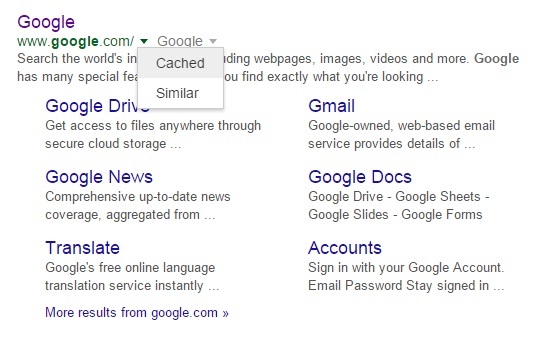 Replace "your site address" with the web address whose cached snapshot you want to check. Apart from manual method, there is custom cache option also. Simply search for query you're looking for and in google search result page, click the "down arrow" button available right to website address whose cached data you want to find. A small drop down menu will appear showing two options as "cache" and "similar". Here similar option will display all results as displayed in case of related operator. See how in below picture, I used it for Wikipedia. Worrying about school/college assignment project? Or want some interesting tutorials for self-learning purpose? There are thousands of download stuff waiting for you. Don't worry! Google can help you to find them. It is excellent in detecting readable file formats like pdf file ( .pdf ), word document ( .doc or. docx ), powerpoint presentation ( .ppt or. pptx ), Excel documentation ( .xls ) etc., Now you don't need to work hard further. 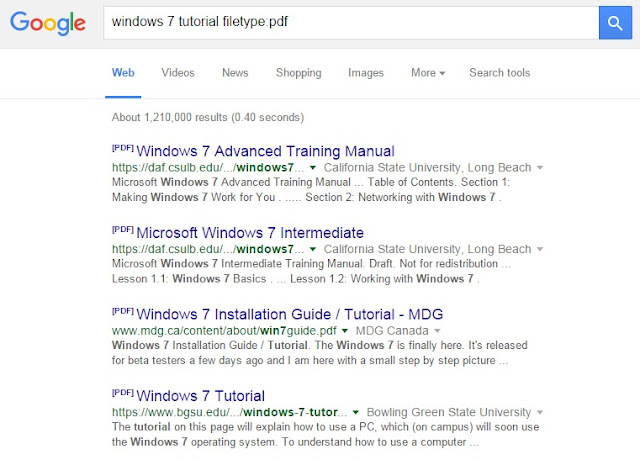 Simply google search with filetype operator and get already well-prepared projects of your choice in single place which is not less than getting way to goldmine. filetype operator will filter all download files in particular file format. Syntax is same as that we use in above operators. The result preview is show in below picture. Speaking frankly, you can't use this operator to find all kinds of format including exe, batch, apk etc., As above mentioned, this can be applied on readable file formats only which are as follows: pdf, ps, dwf, kml, kmz, xls, ppt, doc, rtf, swf. Apart from 4 operators as mentioned above, there are few more useful search operators you should know. In below table, I have listed them all with their syntax and properties. link: Find pages that link to a certain page. For More Help, Please refer to google support page. Putting words or phrase under quote will result into pages including same words in same order. This will be helpful only when you are 100% sure about the results. Don't use it if you are not confident. Otherwise you may miss helpful results by mistake. Now move to the example: simply write your words/phrase under quotation mark ( " ), something like this: "How To Create Simple Program". 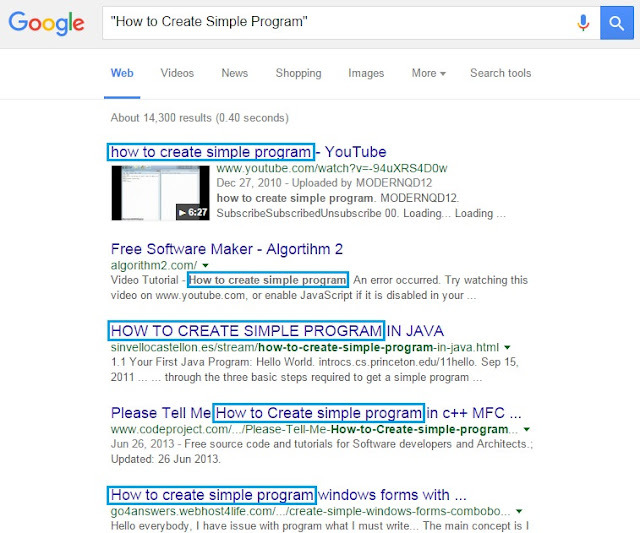 This will result into posts having "How To Create Simple Program" phrase with same order of words. It doesn't matter where they appear i.e., inside body post, in title tag, in web address etc., See the result in below picture. Now Try yourself by writing something like this: "How To Secure Facebook"
"How To Secure" is inserted inside quotation mark to get exact paring of phrase. 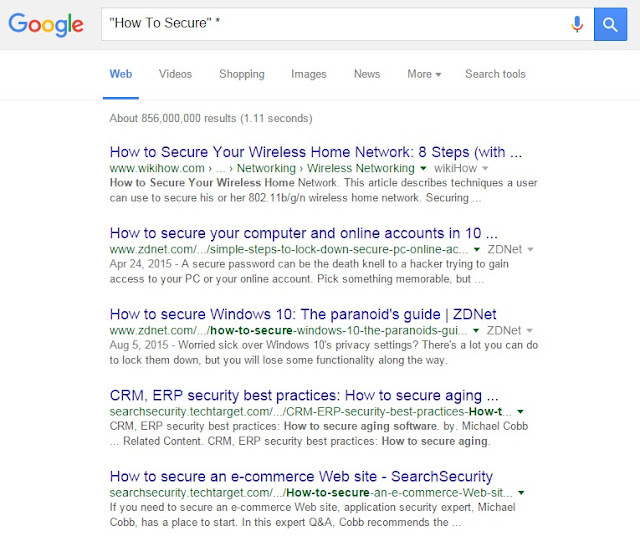 See how in below picture, this wildcard is used which results into top 5 results as How to Secure Your Wireless Home Network, Computer, Windows 10, Aging Software and e-commerce Web site. ( each having different terms ). Let's take another example - Apply this wildcard as: "create a * account". This time it will look for unknown words or phrase between "a" and "account". The results thus found are quite interesting. Try yourself & let me know! Almost all social media websites uses hashtag. So what is it? In simple words, It is a word or phrase used after Hash ( or pound ) symbol ( "#" ) on social media which represents message on specific topic. These hashtags are generally made to filter trending topics. For Example: Net Neutrality is a trending topic now a days. Now searching like this: "#Net_Neutrality" over google will filter all those posts, photos, videos from different websites having this term as hashtag. Instead of Facebook, hashtags are more successful on Twitter. Now let's take another example. Recently Facebook CEO - Mark Zuckerberg has supported digital India. Lots of people are using its hashtag for support. 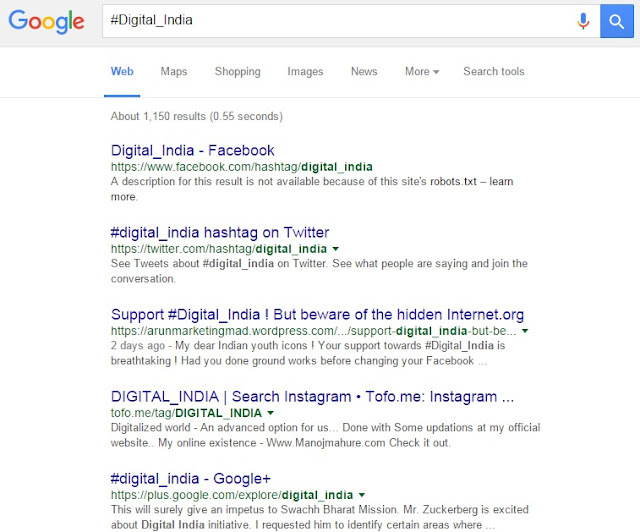 Searching something like this: "#Digital_India"will result into all article having this topic. Now the question arises how they are useful? For Instance think that you want to know about some trending topic ( say net Neutrality ). You want to find how people are reacting on this topic? What's presently going on? How people are discussing? Want to join such discussion? and much more. In such cases hashtag can be useful. Here are few more punctuation & symbols which can he helpful from finding social tags to fixed price rate and google plus pages. All of them are listed below with their properties. 10. 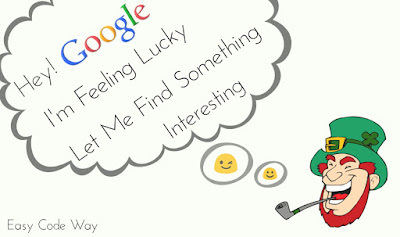 What is "I'm feeling lucky" feature in google? 2. 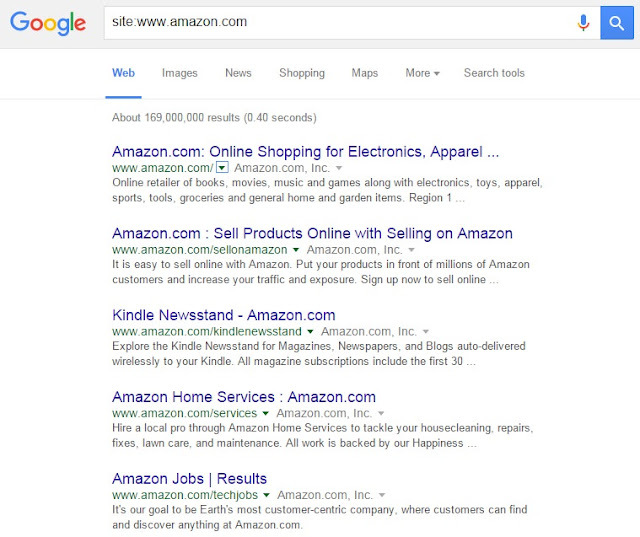 Now under google instant search prediction, tick mark "never show instant results" button. Usually when you search for something, it instantly shows some related results and home page screen will disappear before you write completely. Using above steps you can stop google doing this by which home page will stay until you yourself doesn't press any button. What's similar to "I'm feeling lucky"? Now hover to "I'm feeling lucky" button and press for few seconds. It will start rolling & end with any of the random button as mentioned above. If you land on "I'm felling artist" button and click it without typing any query, google will move you to the doodle page from where you can find artistic articles. Same applies to other buttons also. Google has around $110 ( USD $ ) million dollars lose per year due to this "I'm feeling lucky" button. This is because of ads that are skipped while users are directly moved to most relevant website without showing search result page. Bored of using default calculator? 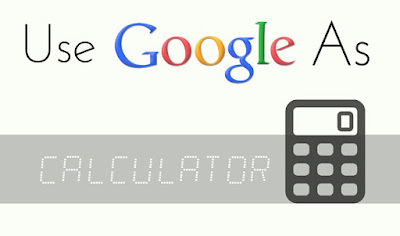 Feel the real power of Google - make it your first choice as online calculator. Using it you can solve from simple maths to more complex one. OK. First start with simple maths which include addition, multiplication, subtraction and division. If you have turned OFF instant predictions, then turn it ON first. Simply undo steps that you followed in #10th Trick. Now go to search tab and write your math problem. For example: If I want to know what is the addition of 12 with 15, then I will write 12+15. Don't press enter after this and wait for few seconds. It will automatically display calculated result. Same can be applied on subtraction, multiplication and division. Now we will discuss about queries including trigonometric functions and complex equations. For trigonometric function, first write trigonometric ratio and write the value to find under simple brackets as follows: sin(value). Example: "sin(30)" or you can write "sin of 30". Same can be applied on other trigonometric ratios, logarithms and exponential. At last for complex equations like: square of 12 - write something like this "12^12" or "12 to the power of 12" and it will result into 8.91610045 X 10^12. Now to find fourth root of 81 write something like this: "fourth root of 81" which will result as 3. You can refer to google support page for more help related to this. Now filter your keywords, location of keywords, domain name, file format and much more. Use commas to separate each keyword or phrase. 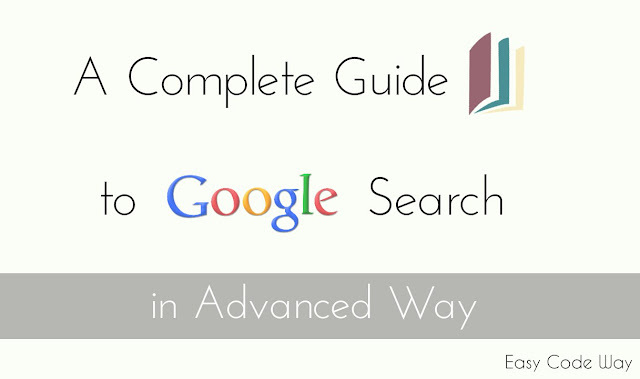 So this is complete guide to use google search in Advanced way. Now it's your turn. Go ahead and nailed internet. Hope it works for you. Finally If you have any problem, fell free to comment below. I will try my utmost to solve your issue. What other amazing ideas do you have on this topic? Let me know!